One of the desserts we serve at Wedgwood is a marmalade on toast crème brûlée; it has a layer of marmalade in the bottom of the ramekin and then a toast-infused cream that is set on top. It tastes fantastic. This is basically a peanut flavoured custard set into a ramekin on top of some jam. 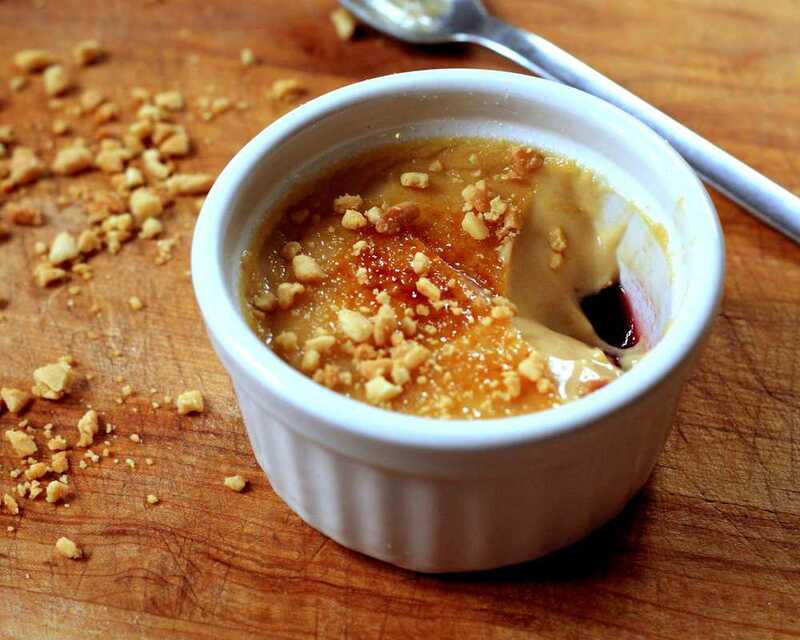 To ‘brûlée’ a normal crème brûlée, sugar is sprinkled on top and then caramelised with a blow torch or by grilling. Tony, one of the Wedgwood chefs, suggested sprinkling on some toasted crushed peanuts at the end to create extra crunch, which I thought was a great idea. I decided to use salted peanuts, as the peanut butter contains salt anyway and it gives a nice contrast to the sweet cream and jam. Heat the strawberry jam until it melts. Strain through a fine sieve then pour into the bottom of 6 or 7 ramekins, depending on their size. Place in the fridge to set. Crush the peanuts into small crumbs and toast in a frying pan until golden. Set aside. Put the cream, milk and peanut butter into a saucepan and bring to the boil, stirring with a whisk to incorporate. Set aside. Place the eggs and caster sugar in a metal bowl, and whisk over a pan of simmering water until it forms ribbons when lifted up. Pour the peanut butter cream onto the egg mix, continuing to whisk. Heat the mixture on the pan of simmering water, stirring constantly to prevent it sticking. Thicken again until it makes thick ribbons when you lift the whisk up. When your pour the mixture into the ramekins it should be thick enough that it only just levels out. Place in the fridge for several hours to set. When fully chilled, sprinkle a thin layer of sugar over and caramelize with a blowtorch. Quickly sprinkle some toasted peanuts over before the sugar has cooled, so they set into the caramel.